The US operator of the Avanti P 180 has announced a new product, which bridges the gap between fractional aircraft ownership and buying into a card program. Avantair currently offers fractional aircraft ownership in the P 180, starting at 1/16 or 50 hours per year of flight time in a five year ownership period. It also offers a prepaid card program sold in 15 and 25 hour blocks. The new Axis Club membership program is somewhat of a hybrid between these two. Customers pay an initial membership fee and can then purchase flight blocks of 25 hours at a set rate for a three-year term. For instance, for an initial membership fee of $75,000 a customer can then buy up to six 25 hour blocks at $80,000 each. In comparison the stand alone 25 hour card is $115,000. The other levels of the Axis Club enable purchase of up to 12 or 18 of the 25 hour blocks over a 3 year period. 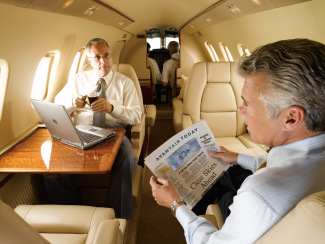 The Axis Club membership bridges the gap between fractional ownership and time card programs, affording customers the opportunity to enjoy the benefits of private travel with Avantair, while reducing the initial outlay of funds required to purchase a fractional share, commented Matthew Doyle, Avantairs Senior Executive Vice President of Sales and Marketing. The P 180 has a range of about 1,440 nm and a typical trip is from New Jersey down to West Palm Beach, which Doyle said they probably do a dozen times a week. Avantair has 52 aircraft in its fleet and is adding a new one every 6-8 weeks with about 50% of the fleet on the US west coast at any one time.